The New Student Convocation Planning Committee is seeking nominations for the 2015 New Student Convocation faculty speaker. The selected speaker will give the faculty address to the incoming undergraduate students during the Convocation on Aug. 27. Maxwell Professor Kristi Andersen was the 2014 faculty speaker for New Student Convocation. 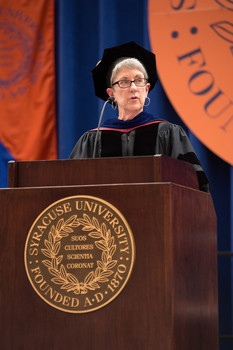 A hallmark feature of the University’s new student orientation, Syracuse Welcome, the New Student Convocation serves as the first official University welcome for incoming students. The event marks the beginning of students’ academic career at Syracuse University and brings the campus community together to celebrate new students in the spirit of One University. The selected speaker will convey a welcoming message to new students that sets the University’s academic expectations and provides advice for personal success at the institution. The committee seeks nominations of dynamic and engaging faculty members to deliver this important first faculty message to students. Syracuse University students, faculty and staff are eligible to nominate faculty speakers. The New Student Convocation Planning Committee is co-chaired by Associate Provost for Academic Programs Andria Costello Staniec and Director of First-Year and Transfer Programs Carrie Grogan Abbott, and includes faculty, staff and student members. The committee will review nominations and make candidate recommendations to the vice chancellor and provost for final selection. Nominations and questions can be submitted to Abbott at cgabbott@syr.edu until April 10.